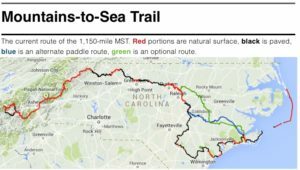 Friends of the Mountains-to-Sea Trail Archives - GetGoing NC! The MST: A completed path or a work in progress? I have a small disagreement with the Friends of the Mountains-to-Sea Trail. They claim that the statewide footpath linking Clingman’s Dome on the Tennessee line with Jockey’s Ridge on the Atlantic is complete. I believe that because two-thirds of the trail is on paved roads, that it is not. 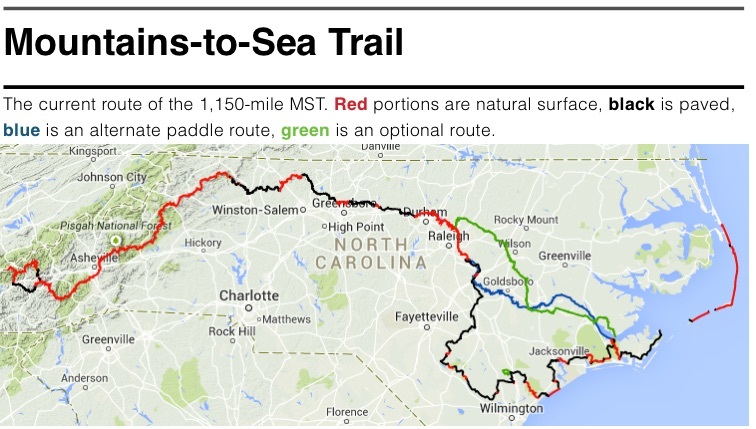 “One of the problems we encounter is the perception that the trail is not complete,” Kate Dixon, executive director of the Friends of the Mountains-to-Sea Trail told the Friends at it’s annual meeting Saturday at Elon University. While Kate and the Friends are pushing hard to convert the trail from asphalt to dirt — 150 miles have been converted since 2008 — she contends the trail is indeed complete, currently running about 1,150 miles across the state. The Friends are even feverishly producing a series of guidebooks detailing the trail, regardless of its composition. Here’s where I’m coming from: As someone who writes about places to explore, I cannot, in good conscience, suggest that people hike a paved road. In my experience, that’s not the escape most people are looking for. Besides, considering that 620 miles of the MST are on bonafide footpath, why suggest that someone hike even a mile on a paved road with little or no shoulder when they could be hiking some of the best trail in the state? The 300 continuous miles of stunningness from Waterrock Knob to Stone Mountain, for instance. But I like to keep an open mind on the matter, which is why at Saturday’s annual meeting I attended a panel discussion involving the 10 hikers who hiked the entire MST in 2014. 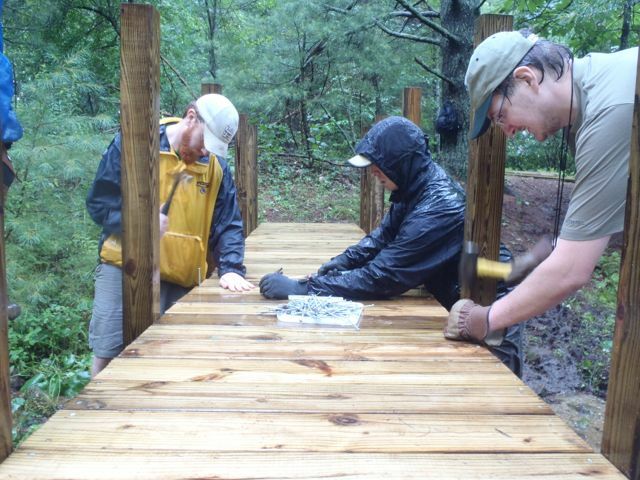 (To date, 47 hikers have completed the MST.) They’d hiked (in one case, biked) about 400 miles on road: how did they find the experience? In part, it was what you might expect. “The monotony of the road killed my feet,” said Patrick le Beau. The asphalt, the continuous pounding. Dogs were also an issue. And there was the traffic. “You haven’t lived until you’ve had 10 pig trucks pass you along the road,” said Craig “Jet Lag” Smith. One of the reasons for a statewide trail is to get to know the state’s abundant and diverse natural beauty. Another reason: to get to know its people. 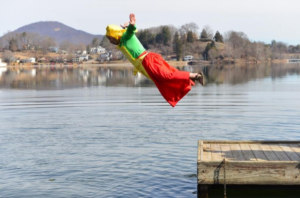 “You don’t realize how great walking on roads is until you meet the people who will give everything to you,” said Ben Banick, who completed the trail with Hannah Krureger. Both are students at Appalachian State University. “People will buy you lunch, they’ll give you a ride,” added Sharon “Mama Goose” Smith, an Iraq war veteran who hiked on behalf of the Warrior Hike program. People, the hikers agreed, are a large part of what makes hiking the MST special. And you tend not to see as many people hiking a remote stretch in the Linville Gorge Wilderness and you do hiking a two-lane in eastern North Carolina. Guidebook writer and hike leader Danny Bernstein moderated the discussion. Bernstein wrote about her completion of the MST in her 2011 book, “The Mountains-to-Sea Trail Across North Carolina,” and she’s a vocal advocate of the road portions of the trail. In large part, that’s because of the people you meet. But she also has a more practical reason for embracing the road sections.